I have a mac. If you want to compile any native code, I can do that for you. Also I've applied to a better connection that applies from tomorrow so that I can get 1 MB/s speed. @SHC That's great! I might take you up on that offer. I'm going to play with Virtual Box this weekend and see if that can help for the short term, and allow me to tinker around. The only thing that really needs to be built is an installer. The actual executable is a .sh that starts up a bundled JRE and the GetDown updater. It needs to run from the user's home directory so it can copy files there and the installer should set up some links to it. That's all the windows one does right now. I will see how I make out after this weekend and then might hit you up. I have the same problem as Dxu1994. Also, I have OpenGL 3.0. Sorry about that @Zeke. I have the fix locally here but have not uploaded it. I should be ready for a major update in about a week and a half. It will include some more levels, other new gameplay features, and lots of fixes. 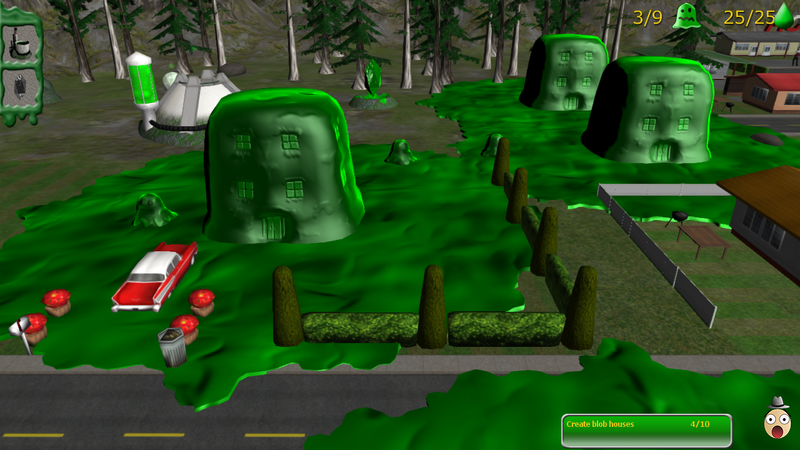 New this week we have added in slime creep to the blob houses. This slime grows over time and spreads out from each captured house. The effects of the slime will be to scare the humans, slow them down, and speed up the blobs that move on it. Not sure what else. It will take some playing with to see what it really should do. The main idea behind it is to have it feel like you are sliming up the town. The slime was created by using a 'marching squares' algorithm. Each blob house is read when it is created and this adds to a list of already created blob houses. The algorithm then uses these points (the houses) and the time they were built to determine how large a circle the slime will be. This information is added to a grid on the map simply stating if it is slimed or not on each square. Then, the marching algorithm kicks in and builds the polygons. The mesh has several animations. The first is a wobble animation in the vertex deform shader. This gives the mesh the feel that it is growing, wobbling, warping, and alive. The second animation is in the fragment shader that displays some green noise on the slime to give it a bit of a glowing and moving effect. This helps make it feel more toxic and that it should be avoided. Great work, i love the noise. Is it possible to gradually increase te blob size, because the sudden jump ruins the effect a bit. Yea the jump is awkward. The way it is built now there is no way to smoothly increase the blob size. At least no easy way I can think of. If it becomes annoying I might rebuild it with another technique. I downloaded the game but "the updater/installer" says that I have to wait 149:47? I will see what's up with that. It is about 500mb, so it will take a little while to download anyways. But usually only around 5-10 minutes for me. I think some simple signal that the blob is growing is going to help, like the outlines of the blob starts to flash a few seconds before they grow of the old school effect of the blob shifting between the old size and the new size a few seconds. That way they won´t just suddenly be bigger and I belive that is what makes it look "awkward". Could be worth a try cause it sounds a lot simpler than rewriting the blob growing code. Tried to give this game another try on my new PC but still got the same shader error. how do you currently make the blob grow? I got this error. You said you fixed it, but then I got this error... haha. I know it is tough. Ill wait patiently. Or I could piss and moan like an american... well I am an american. Ya, what am I thinking? GIVE ME BLOB NOW!!! At the first screenshot there are really nice soft shadows but on other material I can't see those?